there is something funny about this picture, cant put my finger on it thou..
Pet? They should be harvesting that sloth for it’s tasty tasty Sloth Balls. It reminds me of Simon Cowell! Put….Me…..(tune in tomorrow for the conclusion of this sentence). BTW does it look like the girl’s getting a Ghetto Bootie? I’m seeing a bigger reason to worry about a bulge in the front. Also, what is that animal the sloth is holding? @1 : its the fact that she looks kind of like a sloth. I’m wondering why the sloth’s claws aren’t tearing her arm to bloody ribbons. 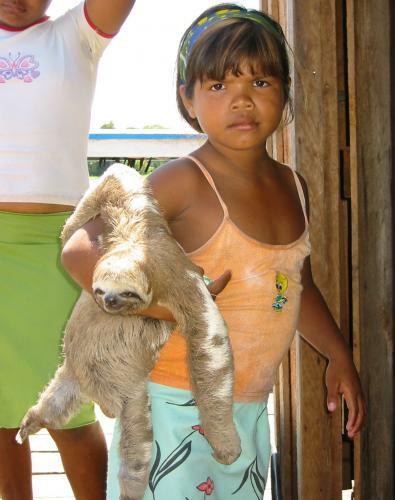 I can’t believe I’m the first person to ask this: why on earth is she carrying a sloth?